In the spirit of Halloween and all things dark and gruesome, today the salon is visited by a most notorious fellow in the rogueish shape of Joseph "Blueskin" Blake. Highway robber, thief and all-round violent chap, Blake enjoyed a career as a professional criminal before his story reached a violent end. No contemporary illustrations of Blake exist though he can be seen in the second panel of George Cruikshank's 1839 engraving, The Last Scene. Blake is cutting Jack Sheppard free of the gallows although in reality, Blake was already dead by the date of Sheppard's execution. Born to brandy shop owner Jane Blake and her husband, Nathaniel, Joseph Blake was fortunate enough to undertake some formal education as a boy and during his schooldays he made friends with William Blewitt, who would later introduce him to an influential accomplice in the form of Jonathan Wild, the infamous Thief-Taker General. Wild lived a double life, on one hand a champion of law and order with an enviable arrest record whilst behind the scenes he ran an enormous criminal empire. Before the age of 18 Blake was already roaming the city as an accomplished pickpocket, known on the streets as Blueskin. The origins of Blake's nickname are lost to history but by 1719 he was terrorising the roads as a highway robber, moving into a street gang three years later and all the time evading any whisper of serious punishment. However, Blake's run of fortune was to end in the winter of 1722 when Wild's men caught up with the gang. Desperate to escape, Blake sustained a head injury and was laid low enough to be apprehended. With the shadow of the Tyburn Tree casting a long shadow, Blake agreed to give evidence against his partners in crime, including his old school pal, Blewitt. While three of his former gang mates went to the gallows, Blake sat back and waited to receive a financial reward but his hopes were to be crushed when he found himself held in custody. With the risk of transportation ever-present, the shrewd criminal became a model prisoner, winning his release in the summer of 1724. Upon winning his freedom he went straight to the top of the criminal tree, forming a partnership with the legendary escapee, Jack Sheppard, one man who had refused point blank to work with the Thief-Taker General. Within a month of his release from gaol, Blake and Sheppard burgled the house of William Kneebone and took their rich pickings to a fence, William Field. Unfortunately for them, Field was also on Jonathan Wild's payroll and he went straight to the Thief-Taker, taking with him news of the burglary. 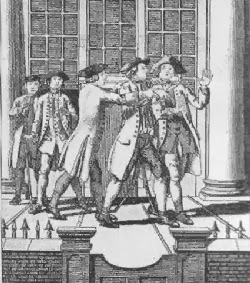 Sheppard was arrested on 23rd July 1724 and taken to Newgate; his trial was swift and he was convicted three weeks later on the testimony of Wild, Kneebone and Field. With Sheppard dealt with, Wild turned his attention to Blake, taking him into custody on 2nd October. His trial took place on 15th October and Blake encountered Wild outside the courtroom. Knowing that his former paymaster was due to give evidence, Blake attempted to convince Wild to go easy on him in court and an argument ensued that ended when Blake assaulted Wild, slashing his throat with a concealed pocket knife. News of the the attack caused a spontaneous demonstration in Newgate and the prisoners began to revolt, with Sheppard using the distraction to make yet another of his infamous escapes. As Wild was taken away for medical attention on the serious but not fatal wound, Blake was convicted and sentenced to death. His date with the hangman was set for 11th November and by the time he reached Tyburn after journeying along packed roads, he was barely coherent with drink. 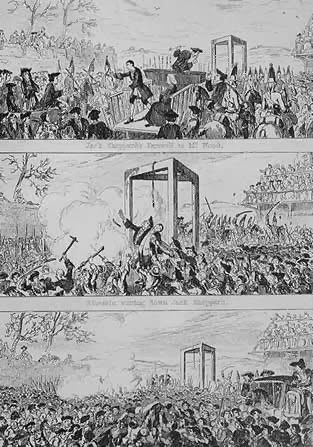 The criminal's attack on the hated Thief-Taker had made him something of an unlikely hero and a crowd gathered to watch his execution, with Blake's short yet eventful career ended by the noose on cold winter day, his body buried at St Andrew, Holborn. Recaptured just a day before Blake's date with the gallows, Sheppard was hanged on 16th November, no chance of a final, daring escape. Wild recovered from the throat wound Blake inflicted but the damage to his criminal career and public persona was immense; he too would face the hangman within the year, becoming part of the criminal history of the capital. So ends a dark tale of crime, corruption and the Tyburn tree... do enjoy your Halloween! What an amazing story and what brutal times they lived in! It seemed only right to have dark tale for the season! Brilliant plates at the start of this post! What an interesting story. Reminds me of that film that Robert Carlisle did. And we think we live in cut throat times now! Cruikshank can always be relied upon! One possible explanation for Blake's nickname is that he was of mixed race. If either his mother or his father was a former slave this would account for it. I have found elsewhere that "Blueskin" means "mulatto".